WinterFest is the 2nd weekend in February. Plan on it! 4th of July Parade with Fireworks in the evening! Always ON the 4th of July!! Roscommon Area Business Expo – 3rd Wednesday in May! Horse-drawn carriage rides, light parade, craft show, poker walk, and more! Roscommon Farmers Market – Saturdays 10am to 3pm, Labor Day – mid October. Lyon Township Family Fishing Festival – 2nd Saturday in June. Find out about area events at our bulletin board in the Village. Thank you for supporting our local Chamber Members and enjoying the friendly and personable service they offer! 5th Street Wines and Craft Beers – Expert advice and great selection! Antiques and Uniques – Find your treasure and enjoy the discovery! Bloomers and Three Fires Bakery – Flowers, Gifts, Chocolates, Gluten Free and Organic Items, too! Bohn Bohn Beads – 1 of 3 stores in the Lake Street Artisans Group – unique shops with a variety of artists and gifts. Loom Room – Explore around Higgins Lake and stop by this quality gift shop with Higgins Lake items, household items, and more. Mermaid Shop – another store in the Lake Street Artisans group. 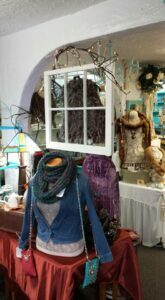 New and Used items of interest, all displayed with an artistic mermaid’s flair. Sand Dollar Designs – Gift shop with boutique clothing and jewelry. Village Hardware – Handy, practical, and fun items for the home and yard. Michigan Warm Hugs Quilts – Quilting supplies, fine fabrics, notions, classes, and local gift items. Sports Barn – Bait, fishing supplies, and expert advise! Pioneer Hills Marine – Boats, water sport supplies, jet skis, fishing boats, all terrain vehicles and everything you need for a great day out on the lake! Winter brings the opportunity for snowmobiling, cross-country skiing, ice-skating, sledding, snow shoeing, ice fishing, and simply taking a walk surrounded by beauty. Winterfest Fun – Friday and Saturday, 2nd Weekend in February. Homemade sleds made of cardboard, paint, tape, glue! Business and Children’s entries – Shown above: Chemical Bank of Roscommon.